BBC NEWS | Asia-Pacific | How did Thai protesters manage it? 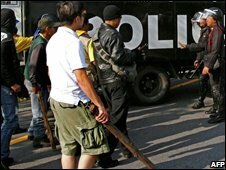 How did Thai protesters manage it? Claiming victory, the yellow-clad hordes from the People's Alliance for Democracy (PAD) rolled up their mats and sleeping bags. They queued for souvenir autographed scarves - yellow of course - from the leaders who had taken them into this astonishing act of insurrection, and boarded buses and pick-up trucks for the ride home. An army of cleaners, technicians and security personnel moved in behind them to get Bangkok's $4bn (£2.7bn) state-of-the-art airport back into operation. Within a few days the mass sit-in will just be a surreal memory. But the questions their actions have raised about the state of Thailand will continue long after the last plastic hand-clapper is picked up and disposed of. How could a country as advanced and as dependent on exports and tourism as Thailand allow such a vital transport hub to be stormed by a mob that never numbered more than a few thousand? What is the PAD, and what gives the movement the confidence to commit its dramatic acts of economic sabotage without fearing any legal sanction? The airport sit-in shows the PAD's skill at pulling off bold and unexpected stunts. When the first PAD convoys approached the airport last Tuesday, they said they were only going to protest against then-Prime Minister Somchai Wongsawat, who was due to arrive back from the Apec summit in Peru. The government had a strategy of avoiding confrontation - it did not want a repeat of the disastrous events in October, when several PAD supporters were seriously injured in clashes with the police. The police were under orders not to use force and retreated. No-one thought the PAD would try to take over one of the world's biggest and busiest airport terminals. In fact, PAD organisers told the BBC they had carefully planned the seizure of the airport weeks before. The weakness of Thailand's police is also important. They have proved no match for this determined and organised movement. They are poorly trained in riot control, and lack the status of the army. When it became clear that the PAD was set on taking over the airport, the local governor asked the army for assistance. None came. As throughout this year, the army's refusal to help contain the PAD has left the government with no means of resisting this insurgency. The police are up against an organisation of considerable logistical strength. It is a remarkably well-trained and well-funded movement. One of the many retired generals supporting its occupation at the airport observed that it should be seen as a military, not a civilian organisation. Behind the "aunties with clappers" and well-groomed young women clutching lap-dogs that are the public face of the movement are squads of hoodlums, armed with batons, metal spikes and hand-guns who man the barricades and hunt down intruders. One morning I followed them as they dragged an alleged government spy off to an undisclosed location, kicking and punching him. I was unable to find out his fate. Some of these thugs are members of private armies run by retired generals. The PAD's logistical efficiency is impressive. Within hours of occupying the airport it had ample supplies of food, water, blankets and medicines for the thousands of supporters who joined the sit-in. The food never ran out. You could get your mobile phone charged, or have a massage. PAD cleaners were brought in to keep the floors and toilets in order. The duty-free and check-in areas were sealed off and vigilantly protected by PAD guards. The PAD's propaganda arm is equally impressive. It runs its own television station, ASTV, which is widely broadcast and pours vitriol on the government. Everywhere the movement goes it takes mobile stages, on the back of trucks, which blare out speeches and music from dawn until the small hours of the following morning. The message is simple: Former Prime Minister Thaksin Shinawatra is evil, stole the people's money and will destroy the country. The poor rural people who voted for his party were all bribed, and unable to think for themselves. Some of those taking part in the airport occupation had been listening to these firebrand speeches for months, without a break. They all passionately believed their actions were worth the cost to the country, to see Thailand's politics cleaned up. The question of who is behind the PAD is a subject of intense speculation in Thailand. I met a lot of ethnic Chinese entrepreneurs at the airport who were helping keep the PAD supplied. But much bigger Thai businesses are widely believed to be financing the movement, including at least two national banks. Thaksin Shinawatra made a lot of powerful enemies while he was in office with his aggressive efforts to re-shape the country. These are now using the PAD militants to get back at his party. There are also plenty of former military commanders offering their help to the PAD - people like General Pathompong Kesornsuk, who has openly urged the army to launch a coup against the government. One of the top PAD leaders is Chamlong Srimuang, a former general with close ties to Gen Prem Tinsulanonda, the king's most senior advisor. Then there is the most sensitive question of all - the royal connection. The PAD has justified its actions as being in defence of the monarchy, and the king's portrait has been displayed prominently during all its protests. Senior figures close to the palace have openly supported the movement. When the queen offered to preside over the funeral last month of a PAD protestor killed during clashes with the police, it appeared to be a tacit blessing for the movement. Some in the government even believe the revered king may be backing the movement, although at the age of almost 81 this seems unlikely. Hard evidence is difficult to come by. But people's actions in Thailand are now being driven as much by what they believe as what they know to be true. The government and its rural followers believe there is a palace-army-elite conspiracy to rob them of their electoral mandate. The PAD and its middle-class followers believe the pro-Thaksin camp intends to turn Thailand into a republic, and overthrow the existing social order. With so much believed to be at stake, compromise between the two sides is almost impossible.